If you ordered this calendar thinking you were getting pictures of cream cakes, reminders to take a candlelit bubblebath with a friend, and other naughty indulgences, think again. This is about seeking the indulgence of the Church for the cream cakes, bubblebaths and other wicked sins you've been committing. The calendar helpfully gives a month-by-month guide to the days of the year when special-offer indulgences are available from Holy Mother Church, as well as reminding you to fast on Fridays, confess on Saturdays and go to Mass on Sundays. And there are even special features on how good the Pope is, and how bad contraception is. Earn time off in Purgatory! Fret over the state of your soul! 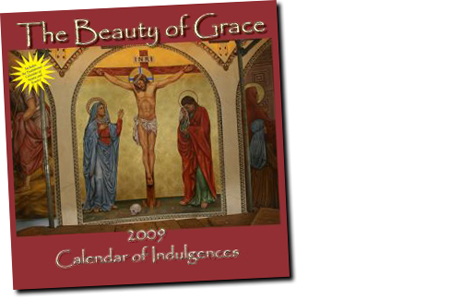 Get your Calendar of Indulgences for just $2 (was £12.95). Buy yours today!